There is a rumor that says that making polenta from scratch is tricky, labor-intensive, and better left to Italian mamas. I was fooled by this belief for a long time, but I know better now. Today’s the day when I invite you to also see the light. Here is how to make vegan polenta! Spoiler: it’s a lot simpler than you think. If you’re a North American like me, you were probably raised on wheat (in bread and pasta) and potatoes as your primary source of carbohydrates. Until very recently, I only ever thought of corn as something to eat on the cob. I still think it’s the most amazing way to enjoy this nutritious vegetable, but only when in season. I am now discovering that ground up corn, also known as corn meal, can add some variety to our fall and winter table while delivering a nutritional package that compares advantageously to quinoa – while costing a lot less. 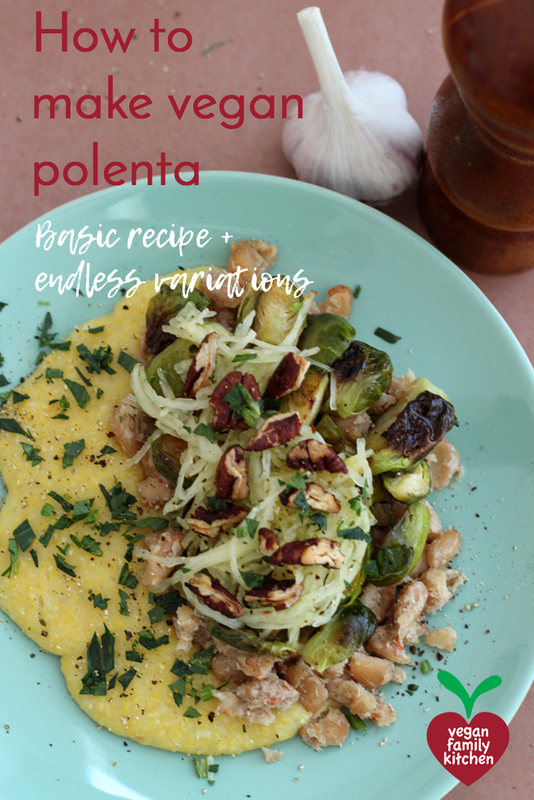 Polenta can be served “fully loaded” with your favorite cooked vegetables and beans. It also makes a great background for vegan sausage. (Think Italy’s response to “bangers and mash.”) Keep a few cups of medium corn meal in your pantry (preferably in an airtight container) and be prepared to give a second life to many an orphan leftover. Spaghetti sauce? Yes! Roasted vegetables? Of course. 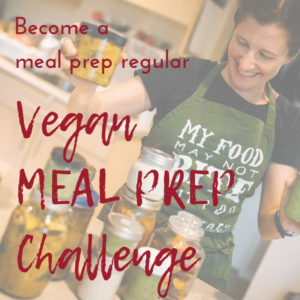 Leftover pieces of vegan meat? Why not? A few tablespoons of mushroom gravy? MmMmmmmMm! My current favorite is to roast some vegetables at the same time as I cook the polenta, adding a small tray of nuts to the oven in the last 10 minutes. I set the heat very low and a timer to go off every 3 minutes. Then I am free to roam around, do some light chores or watch TV with the kids, as long as I come back every time it beeps to stir the polenta, scraping the bottom to prevent it from sticking. It’s really not a chore at all. When the veggies are roasted and the nuts toasted, I just need to pile everything on nicely on a plate and enjoy. If there are leftovers, or if I have the foresight to cook a bigger batch, I pour it into a small silicone loaf pan and let it cool off. It solidifies pretty quickly. I can then keep it in the fridge for later this week, or freeze for later. When ready to eat, just slice and grill in a pan. If you don’t have a small loaf pan, you can also spread the cooked polenta on a sheet of parchment paper or silicone baking mat, about 1/2 inch thick. Wait for it to solidify and cut into squares to achieve the same results. 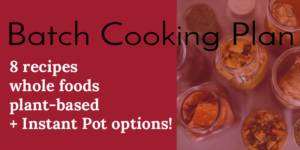 Check out the recipe below and pay close attention to the suggested variations, too. This fabulously versatile side dish will add a rustic touch to many of your cold-season meals. What do you think would work well on polenta? In a medium pot, bring the 4 cups of broth or water to a boil. Slowly pour in the polenta, stirring at the same time to prevent clumps. Turn the heat down to low so the bottom doesn't burn, and keep stirring every 2 to 3 minutes, scraping the bottom of the pot every time. You should achieve doneness in about 30 minutes. Taste to check whether the result is as smooth as you like it. If it's still gritty under the teeth, you can cook for a little longer, adding more water. It should not be completely runny, but still fall off a spoon. Add the nutritional yeast, garlic, fresh pepper, and vegan butter or olive oil (if desired). Stir well. Taste and adjust seasoning, adding a little salt if required. Add more ingredients if you wish (see notes for variations). You can enjoy your polenta immediately. Or you can spread the polenta onto a sheet of parchment paper or silicone baking mat, about 1/2 inch thick, and let it cool off, then cut into squares that you can then grill in the pan (now or later). Or you can pour the hot polenta into a small loaf pan, let it cool and solidify, and then refrigerate or freeze... with the prospect of slicing and grilling later. Endless options! Replace 1/4 of the corn meal with quinoa for a multigrain polenta. Or roughly ground buckwheat. Like it creamy? 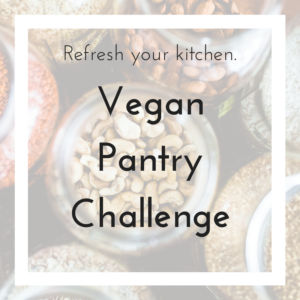 Stir in 1/4 cup of your favorite plant-based milk at the end. Polenta can carry many other ingredients in its smooth wake: roasted red peppers, chopped greens (Swiss chard, kale, spinach...) or herbs (parsley, basil...), sundried tomatoes, sliced olives, and tangy feta-style tofu, and more! I personally prefer small pieces (1/4 inch or smaller), but nothing horrible will happen if you experiment with bigger pieces. 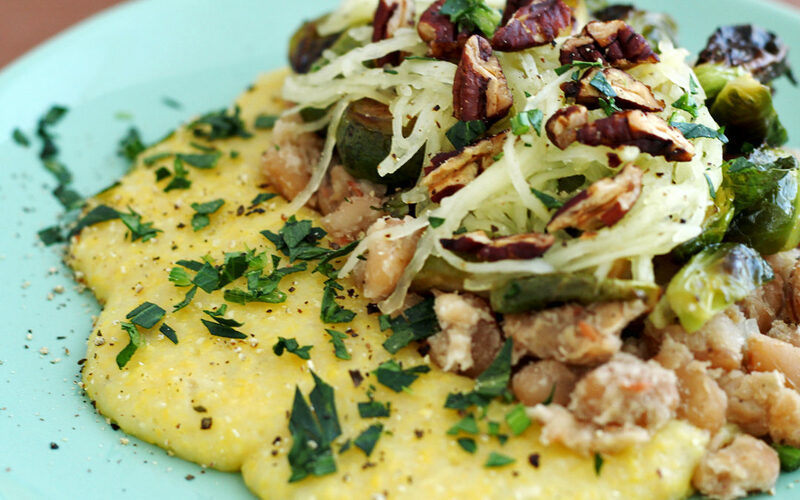 What to eat with polenta? It's also comforting all by itself. Enjoy!